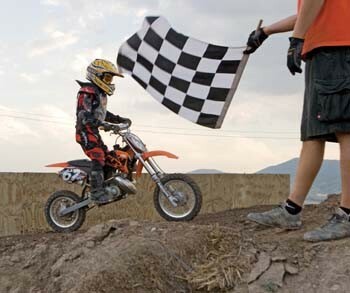 Young riders increasingly participate in the life-and-death jumps and crashes of the sport. 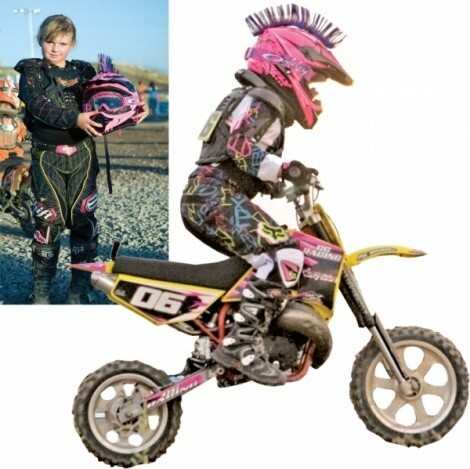 Looking like a pink Power Ranger in her pink and black helmet, racing jersey and pants and knee-high rubber motocross boots, 8-year-old Cheyenne Craig is standing with her arms out to the side like a penguin as water drips off her clothes. “I got wet,” Cheyenne, who is hyper with pre-race excitement, tells Austin Iverson, 12. A few minutes before, Austin had cooled himself off in the 95-degree weather the same way as Cheyenne, by chasing after one of the water-spraying trucks that continually patrol the grounds of Rocky Mountain Raceways to keep the dust down in the rows between racers’ trailers. When the starting gates drop, the “powderpuff” girl riders take off on their tiny 65 cubic-centimeter motorcycles, whose engines’ whine is a comically high-pitched rendition of the bigger bikes’ rumbling. Right out of the starting gate, Cheyenne shoots ahead of the other riders in her class. The little riders do four laps around a modified version of the 6-acre track, skipping the upper loop that has bigger jumps for older riders. A volunteer flagger at the end of the track loop raises a checkered flag as Cheyenne buzzes by, winning her heat—which in motocross is called a “moto.” Austin, watching along the sidelines, admits he’s been beaten by a girl before. After her first bike moto and her first ATV moto—Cheyenne also races ATVs—she is relaxing in the back of the utility trailer that hauls all her gear with her dad, Rod, her mom, Jody, and family friend Paul Housley, whose 11-year-old son Shayden is also there to compete. Rod and Jody are divorced but you’d never know—they both attend Cheyenne’s races (“They don’t fight,” Cheyenne precociously points out). Paul is divorced from Shayden’s mom, Deann, but she is also in attendance, sitting about 50 yards away with Shayden and a group of other little riders and their parents. The two families seem to exemplify almost to an extreme the motocross maxim that the family that races together stays together. “Three,” Cheyenne chimes in boastfully, indicating the age she started. “Tell her what else you do,” Jody prompts her daughter. “Karate and ride horses,” Cheyenne says. In her post-race outfit—a T-shirt and ruffled skirt, with her dark blonde hair in a neat braid, Cheyenne appears to be the sugar-and-spice alter-ego of the gung-ho motorcycle rider who just a few minutes before dominated her race (after two motos in the class, Cheyenne took first overall in powderpuff for the day). Logan, who was Cheyenne’s age, died after crashing at a Friday-night race at Rocky Mountain Raceway exactly five weeks before the Pioneer Day event that Cheyenne, Shayden, Austin and Jake are now competing at. In a moto held around 1 a.m. at the end of a long-running night of races that began June 19, Logan overshot a tabletop jump at the bottom of a hill and went outside of the track bounds, hitting a wooden deflection wall. He died hours later of internal injuries at Primary Children’s Medical Center. That jump has since been modified slightly, but not in response to Logan’s death; the track is constantly undergoing slight alterations, RMR spokesman Kevin Elzey said. Logan was riding the bigger of his two motorcycles, an 85cc, and was leading the group of riders when he crashed. According to RMR point standings, in the last seven days he raced, spanning an eight-week period, Logan took first place in the 65cc 6-through-8-age group every time, first place in the 65cc open-age group four times, and first in the 85cc beginner class once, on May 31. Nine-year-old Jake, whose spiky blond hair is a partly grown-out Mohawk, took Logan’s death the hardest among the Iversons. In an effort to shield their children from the tragedy, the Iversons didn’t attend Logan’s funeral, and Jake was full of questions about it. “He was always asking, ‘Do you think he’s in his [motocross] gear?’” Dena said. Jake seemed to make some peace with what happened at a memorial held for Logan at RMR July 1, where the stickers and about 300 “In loving memory of Logan Emerson” T-shirts were sold to pay for funeral costs. “With Jake being able to go up to Logan’s dad, he realized that it was final and he was able to share with him some of those times that they had,” Dena said. Still, the first time after Logan’s death that Jake raced at RMR, he had a hard time going down the hill to the jump where Logan crashed. He told his mom he was going to take that hill slow. “I told him, ‘No, you just go down it as you normally do,’” Dena said.